There is nothing quite like the Mackinac Island experience; a vacation with no automobiles, waking up to the gentle clip clop of horse and buggy, travelers enjoy leisure carriage tours, butterfly conservatories, fudge tasting, hiking, biking and trail riding through Mackinac State Historic Park . Hikers and bikers can enjoy miles of paved and unpaved trails on this beautiful island. Bike rentals are available for a small fee, or you can elect to bring your own along with you on the ferry ride. Mackinac Island is also open for skiing in the wintertime. Limited Ferry service is available through January 2nd. Great Lakes Air makes runs to the island and back for around $24 each way as well. If ice conditions permit (usually around February), it becomes common for snowmobiles to cross the Straits of Mackinac to visit the island. 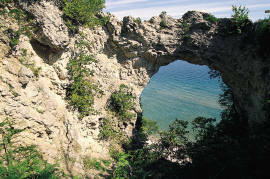 Mackinac Island offers outstanding dining, shopping, arts, architecture and nightlife. Resorts, hotels, historic inns, bed & breakfasts, apartments, condominiums, town homes and home rentals offer the amenities travelers have come to expect from economical to extravagant.